It's been sooooo long since I've posted anything that I have to get re-acquainted with my blog! It's not that I haven't been reading; to pass the time in this hot and humid weather with the special bonus of not being able to drink anything (Fasting Month! ), I go through a lot of books. But mostly, they're just Agatha Christie re-reads or books that I don't have to pay a lot of attention to while reading. I have the massive War and Peace waiting patiently to be started, but in this state, I don't dare to touch it yet. Let a month pass before I begin that particular novel. I'll get to these as soon as my brain decides to function without food or water! Besides my overdue reviews, I have to catch up on some of my challenges. Now, the 2012 TV Addict Reading Challenge I've long given up on for the simple reason that the books are unavailable to me and I can't afford to order so many. That's somewhat sad for me but, hey, there are other books and other challenges; The Historical Challenge, I am happy to say, I have almost completed. With only one book to go, I should be able to finish it in the remaining months. Finally, we have the New Authors Challenge for which I have a couple of new books lined up (the reviews, of course, I'll be posting in August). It has also been quite some time since I've posted anything new on my Why haven't they made the movie?! feature. 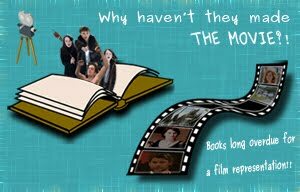 For me, there are always plenty of books I'm only too ready to have turned into movies, and I have the perfect book in mind. Watch soon for a post on Cotillion to pop up! 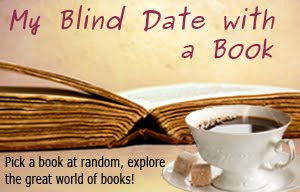 My other feature, My Blind Date with a Book, overlaps with the New Authors Challenge so I'll be updating that soon as well.